In this post we will give you a simple example of custom class loader. We will also touch upon out of the box class loaders in java and the chaining concept. Except the bootstrap class loader every other class loader is written in java. Every class loader except the bootstrap has a parent class loader. When a class loader is asked to load a class, it request it’s parent to load the class. Only if the parent is not able to find the class then the class loader itself will try to find the class. This process is called chaining. Override public Class<?> loadClass(final String name) method. Load class file as java.io.File or resource stream. Convert the file stream to byte array. Call Class<?> defineClass(String name, byte b, int off, int len) method in the java.lang.ClassLoader class. Call void resolveClass(Class<?> c) in the java.lang.ClassLoader class. * This class loader shall load classes from a custom location which is not part of the class path. * In real time scenario this location can be a network file system, or a socket or an encrypted class. * the class then this class loader shall try to load the class by itself. //This means the parent class is not able to find the class. * This method shall take the class name and load the class file. * com.ourownjava.corejava.util.ClassToLoad is in class path so the system class loader should load it. 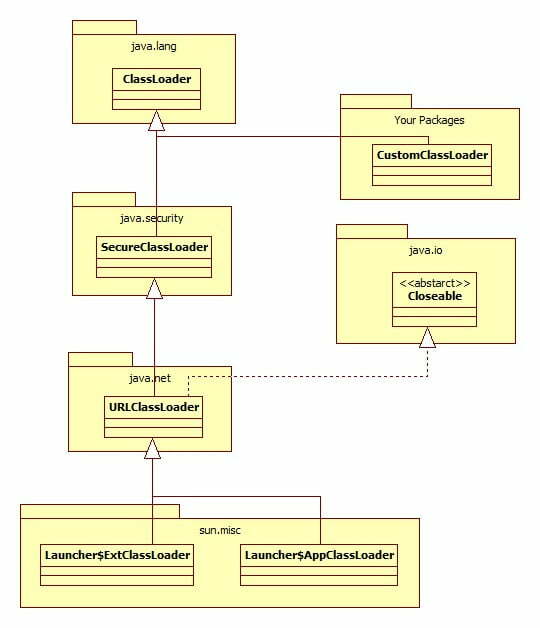 * org.sanju.corejava.util.ClassDoesNotExistInClassPath is not in class path, so the custom class loader should load it. « Java FileWriter V/S BufferedWriter.